It can be a long hot summer and sometimes you just have to break out the fun baseball games for a practice. I know you have a lot of drills you want to work on, but if their minds aren’t in the game, then they need a break. And rather than taking them swimming, try one of these fun baseball games to change practice up a little. While these games are more about having fun, they also keep a baseball in their hands. And if after reading this article you want to check out a couple more, go over to our page titled “Fun Baseball Drills”. Here is a game I used to play a lot in my younger days. (We are talking a long time ago) And I know it is still popular because my kids have played 500 and I wasn’t the one who taught them. It is a great drill for baseball practice if only about half your team shows up. If you have 12 or 14 players at practice, it could be too many to play this game. You be the judge. This game is really batting and fielding practice, only as a game. You, the coach, pitch batting practice to one player, and the rest of the team covers the field. The fielders receive points for batted balls caught in the air and off the ground. They get 100 points for a caught ball before it hits the ground, 50 points for catching a one hopper, and 25 points for a ground ball. We always played the game where you were deducted the same number of points if you dropped a fly ball, one hopper or ground ball. And when one person gets to 500 points, they get to come in and hit. You can always change the number of points to bat if things are moving slow. There will be times when you will have to referee who gets to catch the baseball. You may have to call out the player’s name that gets the chance to catch the baseball. Flip is one of the fun baseball games that my youngest son loves to play. His summer team has played the game for about three years. I believe they have modified the rules to their liking. So, here is their version of the game "Flip". Four to ten players can play this game. Again, all players stand in a circle a few feet apart. Players wear their gloves and only one player starts with a baseball. In this game players do not catch the baseball; instead they volley or bounce the baseball in their glove. 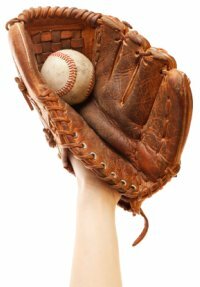 Once a player volleys (bounces) the baseball in his glove, he will toss the baseball from his glove to another player. The baseball must be tossed between the other players knees and shoulders. That player can stop the baseball with his glove and start bouncing it until he is ready to toss, or he can play the baseball off of his body, and start bouncing the ball in his glove. Some people say you can only volley (bounce) the baseball twice before tossing. On my son’s summer team they allow players to move towards the player they are tossing to, and that player can move back. But, if the tossing player drops the baseball in the receiving player’s spot, then that is counted as a miss and the receiving player is out. Any dropped toss, or toss not at the receiving player’s body between the knees and shoulders, and you are not. As always, last man standing wins. Does Your Team Need A Break? So, do you think one or both of these fun baseball games will give your a team a change of pace? If your team is having trouble concentrating all thru practice, then give them some fun. And again, if one of these aren't what you are looking for, try on page "Fun Baseball Drills". Need a Break from Baseball? Check out this website's indoor and outdoor games for kids. your Kid will Love & you will admire.